In a small bowl, mix sugar and flour. Stir in coconut. In a larger bowl, beat eggs lightly. 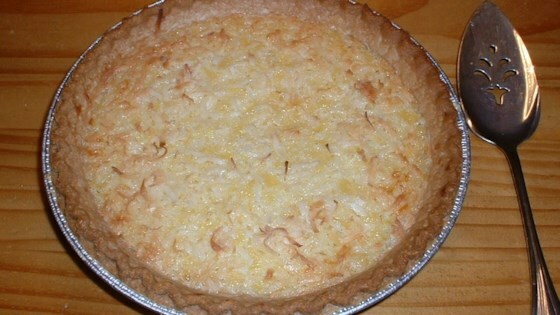 Mix in pineapple, and then coconut mixture. Add melted butter, and mix well. Pour filling into deep dish pie crust. No changes, it is Still in the oven. There was not near enough fillng for a 9 inch deep dish pie pan. It would have taken at least a double recipe for a deep dish pan. Recipe must be doubled!! A little too sweet for us. We wanted pineapple flavor but it was soooo sugary! Easy enough, though. I LOVE PINEAPPLE & THIS IS THE BEST PINNEAPLE PIE I HAVE EVER EATEN. IT IS QUICK TO PREPARE. I USED A GRAHAM CRACKER CRUST, WHICH WAS DELICIOUS ALSO.